Money Saving Expert – A cricket fan saved £90 on a return train ticket to watch England’s test match against India next week  by splitting his journey ten times and printing out 26 paper tickets. A cricket fan saved £90 on a return train ticket to watch England’s test match against India next week  by splitting his journey ten times and printing out 26 paper tickets. Colin Hinchley will travel from Derby to Southampton Airport Parkway next Friday to watch the second day of England’s fourth test against India  but was left stumped when he found out a return ticket could cost him £159.40. But Colin decided to hit back, and after searching for ‘train ticket splitting’ online, he found he could cut the cost to just £69.10 by buying separate tickets for different legs of the trip. He now has separate tickets for his journeys between Derby and Coventry, Coventry and Banbury, Banbury and Oxford, Oxford and Basingstoke, and Basingstoke and Southampton Airport Parkway  and will swing by each of the stations in reverse on the way back. 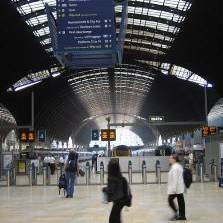 You can find details on these tools and other ways to save money on train tickets with our Cheap Train Tickets guide.